Last Saturday High Desert Test Sites hosted an event at the Copper Mountain Mesa Community Center. Ryan Thompson and Phil Orr, the authors of Bad Luck, Hot Rocks: Conscience Letters and Photographs from the Petrified Forest gave a slide show presentation to a packed house. Believing a curse accompanied pieces of petrified wood purloined from the park, tourists returned the rocks with letters of remorse, recounting the bad luck that had befallen them since making off with the rocks. The letters range from touching to tender to ridiculous, and afforded the authors the opportunity to shed light on different generations of conservation practices. It was wonderful to see so many cars lined up outside the Center, and more than 50 people inside. Kudos to CMMCA board member Kip Fjelt for helping host this event and for the vision to reach out to High Desert Test Sites. 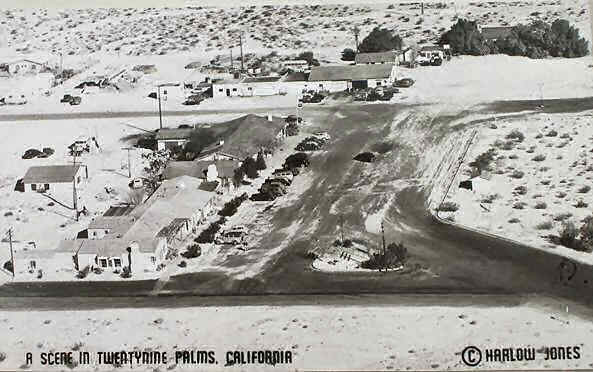 We left that night for the house in Wonder Valley and stopped for take-out at Passion Desert Chinese Restaurant on Two Mile Road and Adobe. Looking around at this cozy little boho commercial enclave I got the feeling that this might be the site of Bagley's store, which I was reading about in the book Sand in my Shoes, by Helen Bagley. I thought it had been on the highway but I later found out my intuition was right. The larger building with the dark roof was the Bagley's store. Passion in the Desert Chinese Food is in the corner building and there are now buildings across the parking lot. There's an art supply store, a florist, a knick knack shop and a game shop. I'm going to have to go back again to scope out this place. The next morning we went to the The Palms Restaurant in Wonder Valley for breakfast and ran into friends. New Jimmy (I called him "New Jimmy" as the Palms has a plethora of Jameses and Jimmys and this gentleman was new to me and New Jimmy sounds better than Jimmy in the green hat.) 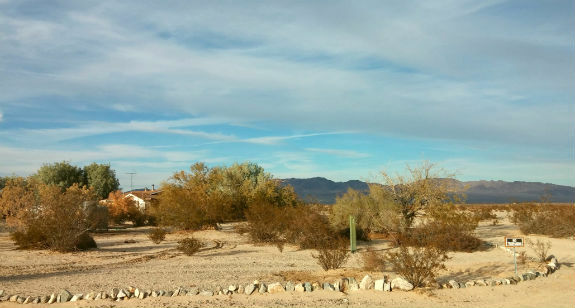 had bought property off of Amboy Road and we all went over to see it. It had beautiful views but needed lots of hauling as so much of the previous owner's belongings had been abandoned. 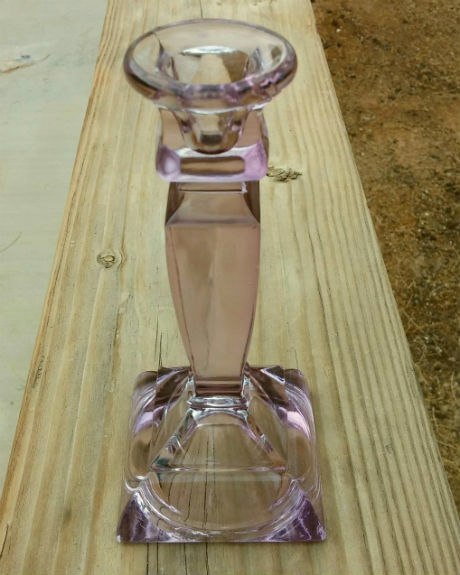 Near an old trailer I found a beautiful leaded glass candlestick, turned purple from the rays of the sun. Jimmy told me to take it and so I did. A friend reminded me that the purple color is a defect and makes the glass worthless. Maybe, but not to me. It's the first piece of sun-colored glass I've collected and it makes me feel just a little bit more like I live here. I've got around 11 months to look at it before the Twentynine Palms Annual Weed Show to which I promised to submit a piece next year. Out front I stumbled into a pet cemetery. The sun was so bright that I had to guess at the framing of the shot as I couldn't see the screen. I apologize for missing most of the row of neatly laid out graves. 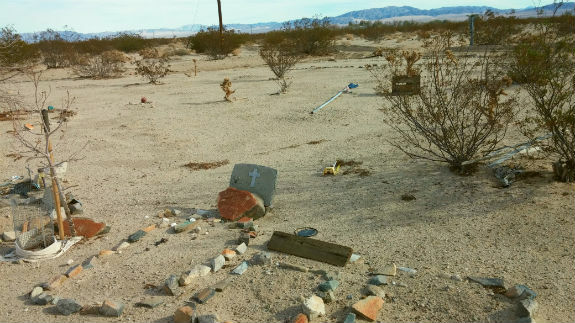 There were 6-8 graves lined up. 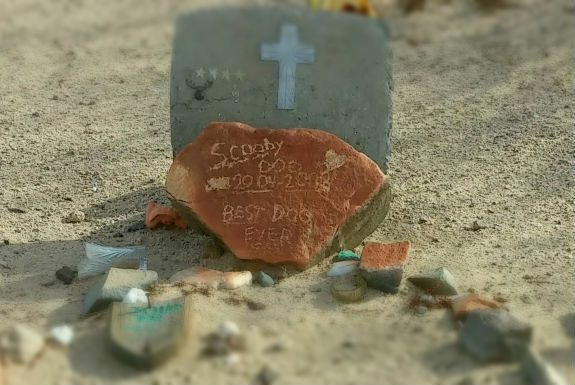 The dog Scooby Doo seemed to be either the best loved or last dead as his was the only name that remained. I could feel the ghosts of the children carefully arranging the stones as they tried not to cry. Scooby Doo 2004-2008, Best Dog Ever. Later in the afternoon I visited my neighbor, Glenda, across the street. Glenda and I walked her property looking for mesquite resin. They'd been forced by the insurance company to trim the mesquite trees growing too close to their house and I'd seen lots of resin at the wounds. She tasted the resin at my urging, but didn't seem to care for it. 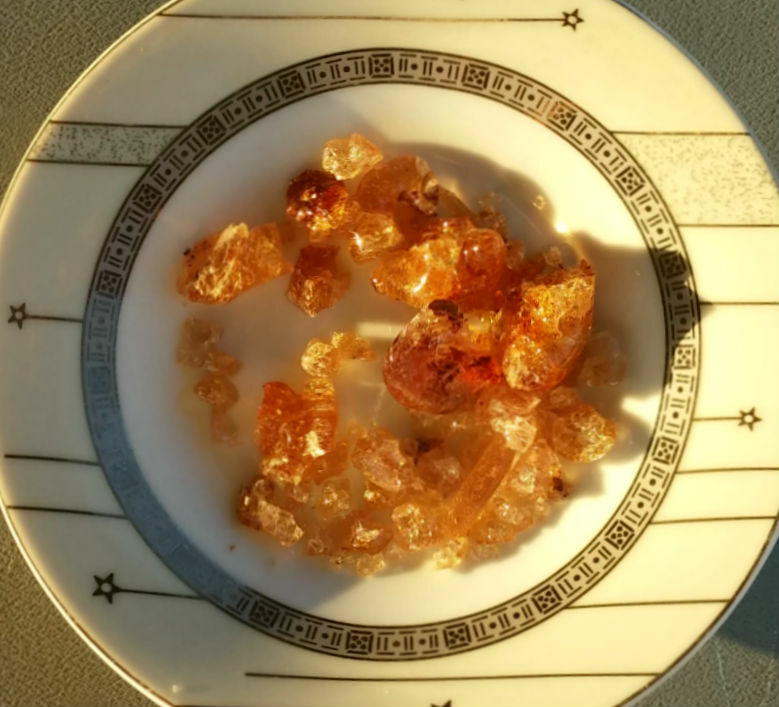 Mesquite resin is water soluble and melts in your mouth like a lifesaver. There is a hint of sweetness and a hint of postage stamps, for those who remember when you had to lick a postage stamp to stick it to a letter (a paper message sent IRL (in real life) by postal mail). One has to suspend both their technological and colonial imagination to fully appreciate the flavor of mesquite resin. 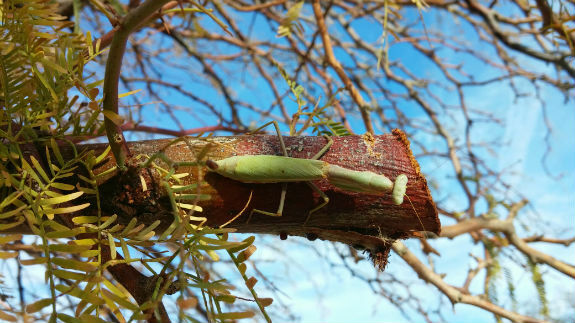 This gentle matind watched us pull the mesquite resin from the ends of the cut branches. The outhouse has been moved off the Wonder Valley property and is now over at Saturn where it blocks, for the most part, a large modern-style house that marred our view. 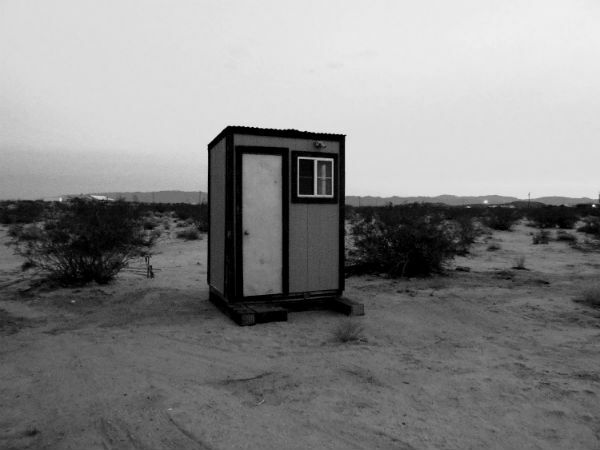 I suppose you could say that the outhouse now mars our view, but somehow an old timey outhouse is less disruptive than a modern house. With this little building gone the Wonder Valley homestead looks more like a proper desert farm, sans animals and agriculture for the time being. The little out building in its new location. A sink and shower will be installed on the left of the building, which will drain to the depression to the left. I plan to install a small native garden there with a couple of shade trees.